Speech Sounds f. How to Elicit the /f/ Sound in Young Children. Speech sounds f. This webpage gives practical advice on how to elicit the /f/ sound in young children. Disclaimer: The techniques to be found on this page are written specifically for speech-language clinicians to use with their clientele. Teachers and parents may also find useful advice here, but the information should not be considered as an alternative to comprehensive speech assessment and intervention. If your child has speech errors please ensure they are assessed by a qualified speech-language pathologist in your local area. If you have queries about your child's speech development please contact professional organizations such as Speech Pathology Australia , the American Speech and Hearing Association, in the United States and the Royal College of Speech and Language Therapists in the United Kingdom. Imitation: Imitation is an important technique when teaching a child any new speech sound. Imitation requires the child to copy the clinician's correct model of a speech sound. For instance, the clinician first engages the child's full attention and then models a clear /f/ sound. The clinician is then silent and the child is encouraged to copy exactly the sound the clinician has produced. In many cases of course the child will struggle to accurately reproduce the sound. This is fine, because the child's inability to correctly reproduce a clear target sound gives the clinician a good understanding of how the child's speech error is occurring. The /f/ sound is a stream of air (fricative) sound. The /f/ is voiceless. That is, the larynx does not vibrate as it does on its voiced partner, the /v/ sound. To produce a clear /f/ sound the upper teeth lightly touch the lower lip. To an observer the impression is that the bottom lip is being bitten by the exposed upper teeth. However the upper teeth are merely touching the bottom, with only minimal pressure. When the breath stream flows through this constriction it produces the /f/ sound. 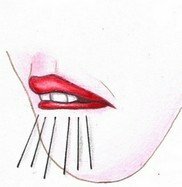 Due to the constriction formed by the teeth and lips, the breath stream is forced forward and slightly down. The /f/ sound is unvoiced. Its partner, the /v/ sound, is voiced. A common sound substitution for the /f/ is the voiced /b/. So fish becomes bish. Demonstrate to the child what a typical /f/ looks and sounds like. You do this by retracting the edges of your lips in the semblance of a slight smile. The upper teeth should be a little exposed and slightly touching the top of the bottom lip. Blow the breath stream through the constriction created by the top teeth resting on the bottom lip. It's ok to exaggerate the sound level of the breath stream at this point to reinforce to the child that the /f/ is a stream of air (fricative) sound. After demonstrating the correct position of the tongue and teeth, encourage the child to raise his bottom lip so that it is just slightly touching the upper teeth. It can be helpful to use a small mirror at this point to give the child a visual reference as to where his bottom lip needs to be positioned. At this point instruct the child to blow air over his bottom lip. It can also be helpful for the child to position their finger in front of their lips to feel for the direction of the breath stream as it passes through the constriction created by the upper teeth and bottom lip. When the child is able to find the lip position it is a good idea for them to change the position of the bottom lip to discover for themself the most comfortable position for producing a clear /f/ sound. The child does this by moving the bottom lip back and forth and noting the difference in breath stream constriction the movement of the bottom lip creates. Return from Speech Sounds f to Speech Sound Errors Return from Speech Sounds f to What is Speech?